It's been 10 years since Wikipedia published its first article on January 15, 2001. TIME takes a look back at the revolutionary online encyclopedia's milestones throughout the decade. 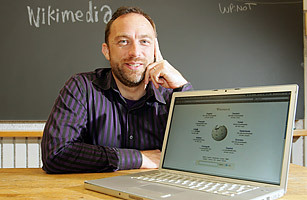 Jimmy Wales incited scrutiny in December 2005, when technology writer Rogers Cadenhead revealed that the Wikipedia head honcho had altered his own biography several times  a practice that is generally frowned upon. Cadenhead wrote on his blog, Workbench, that Wales had made changes to his bio 18 times, including deleting phrases describing former Wikipedia employee Larry Sanger as a co-founder of the site. Although the current Wikipedia article describing how the site came about flat out says: "Larry Sanger and Jimmy Wales founded Wikipedia," there was a time that Wales felt inclined to downplay Sanger's role in Wikipedia's founding. Called out for his transgressions, Wales said that the changes were necessary to clarify and give a more nuanced description of the roles that each of the men played in creating the site. He contends that the changes had nothing to do with the earlier falling out between the two. In 2002, Sanger resigned from Wikipedia, after repeated disagreements with Wales about Sanger's desire to rid the site of "trolls" and "anarchist types."